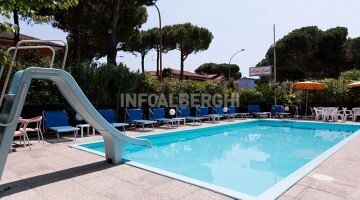 The Hotel Zani is a 3-star hotel in Cervia, which has a garden, swimming pool, open parking space (subject to availability), and WI-FI throughout the property. Admits small pets. It is located in Cervia, a 5-minute walk from the sea. 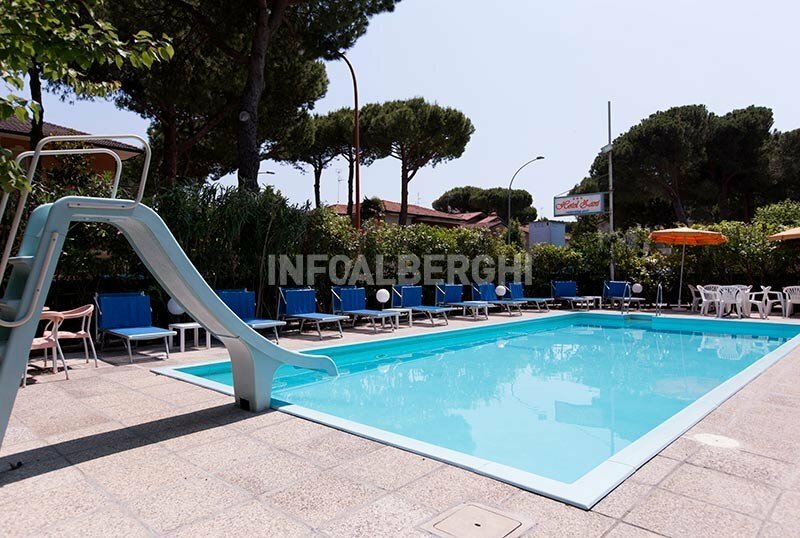 The area is very quiet, near the pine grove and just minutes from the center of Cervia. The rooms have a balcony (also with sea view), air conditioning, WI-FI, telephone, digital terrestrial TV, safe and private bathroom with shower and hairdryer. Swimming pool with slide, garden, terrace, bicycles available for adults and children, bar, reading room, TV room, elevator, free consultation newspapers, free shuttle to airport and station, equipped for cyclists. Organize theme nights. PARKING : uncovered, available while seats last. CONVENTIONS : beach, amusement parks, spas, shuttle service. PETS : welcome small size. LUNCH AND DINNER : choice of menu with meat and fish dishes, buffet of appetizers, vegetables, fruit and desserts. Water and wine with meals. VARIATIONS : kitchen for vegetarians and celiacs. In hotel : live entertainment, pediatrician on request for a fee. At meals : baby menu and high chairs. At the hotel's garden there is a heated swimming pool with a slide for children, a solarium area with sun loungers and WI-FI area. The hotel staff organizes evenings with music and entertainment for adults and children. The hotel has an agreement with Bagno Bologna, a few meters away. The establishment makes available for guests staying at least 5 days a beach umbrella and two sunbeds, as well as all services, entertainment and games area.